"Students didn't have the skills to pay attention and develop an awareness of what was happening, in the moment, with their bodies, emotions, and thoughts... Telling them about prevention wasn't going to help if they weren't present while taking risks." 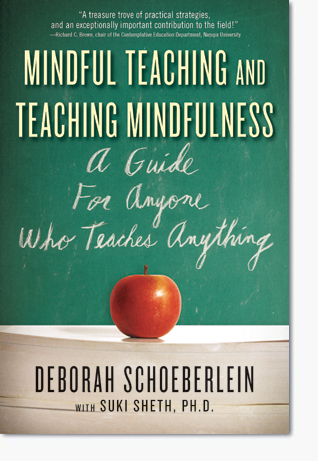 She goes on to explain the benefits of mindfulness practice for teachers and students in any subject area, with many suggestions for increasing our patience, attentiveness, and responsiveness, and then modeling this behavior for students. become more willing to accept challenges. For teachers, there are techniques for beginning and ending the day calmly and reflectively, as well as improving classroom management through modeling rather than demanding behavior. Ms. Schoeberlein is careful to mention which practices might be appropriate for our own personal practice but not for the classroom, and she clearly explains how various activities can be modified in ways that are developmentally appropriate for different ages of learners (K-12).